Caroverine (Spasmium, Spadon, Tinnex) is a drug used as a spasmolytic and otoneuroprotective (inner ear protective) agent in some countries. 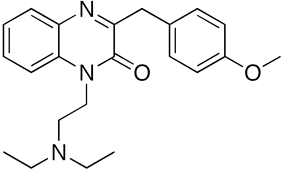 It acts as an N-type calcium channel blocker, competitive AMPA receptor antagonist, and non-competitive NMDA receptor antagonist. It also has potent antioxidant effects. Caroverine has been demonstrated to have a high rate of efficacy in the treatment of cochlear-synaptic tinnitus. ^ a b c Udilova N, Kozlov AV, Bieberschulte W, Frei K, Ehrenberger K, Nohl H (2003). "The Antioxidant Activity of Caroverine". ^ Nohl H, Bieberschulte W, Dietrich B, Udilova N, Kozlov AV (2003). "Caroverine, a Multifunctional Drug with Antioxidant Functions". BioFactors 19 (1–2): 79–85. ^ Denk DM, Heinzl H, Franz P, Ehrenberger K. (Nov 1997). "Caroverine in tinnitus treatment. A placebo-controlled blind study.". Acta Oto-Laryngologica.